Let your little one begin saving for a new bicycle, video game or special vacation with their own Engraved Nickel Piggy Bank. A classic, personalized gift perfect to give a newborn or a grandchild celebrating a special birthday. 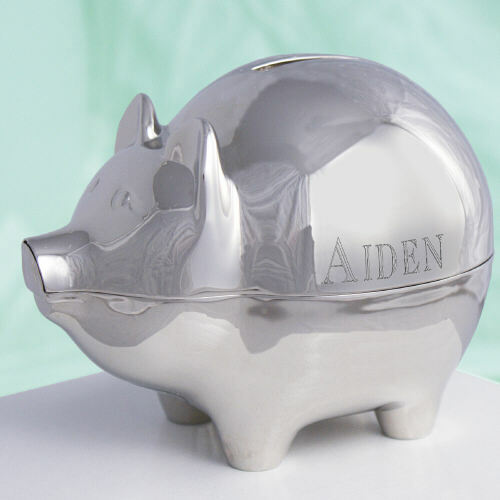 Your Personalized Baby Piggy Bank is nickel plated and measures 3 3/4" h x 3 1/4" w x 5" l. Personalized Children's gifts are customized for you FREE. Personalize your Nickel Piggy Bank with any name. I sent this to my new granddaughter. I haven’t actually seen it yet. I hope they like it. Client loved the gift! Thought it was unique and a fantastic idea for a new baby. Additional Details GiftsForYouNow.com offers a great selection of Personalized Baby Keepsakes Gifts perfect for a Baptism, arrival of a newborn or 1st Birthday Party. We specialize in Personalized Baby Gifts, Grandma and Grandpa will be proud to give.